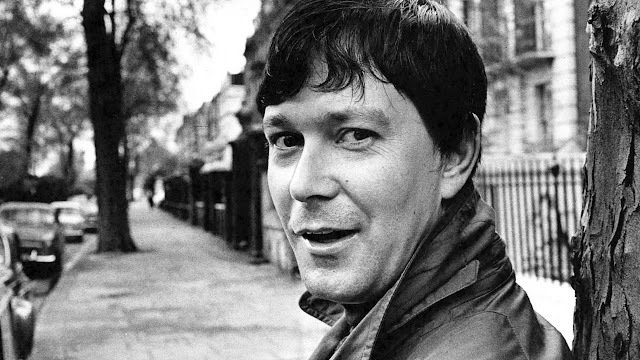 John Kingsley "Joe" Orton was born today, January 1, in 1933, in Leicester, England. He was a playwright and author. His public career was short but prolific, lasting from 1964 until his death 3 years later. During this brief period he shocked, outraged, and amused audiences with his scandalous black comedies. The adjective Ortonesque is sometimes used to refer to work characterised by a similarly dark yet farcical cynicism. Orton became interested in performing in the theatre around 1949 and joined a number of different dramatic societies, including the prestigious Leicester Dramatic Society. He applied for a scholarship at the Royal Academy of Dramatic Art (RADA) in November 1950. He was accepted, and left the East Midlands for London. 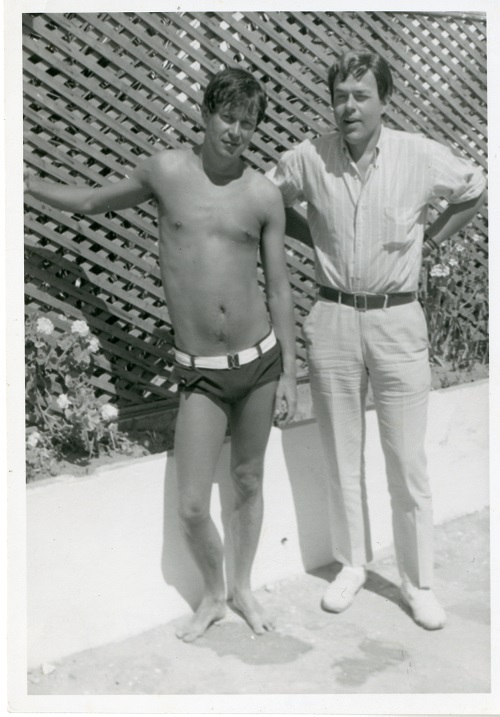 Orton met Kenneth Halliwell at RADA in 1951 and moved into a West Hampstead flat with him and two other students in June of that year. Halliwell was 7 years older than Orton and of independent means, having a substantial inheritance. They quickly formed a strong relationship and became lovers. After graduating, both Orton and Halliwell went into regional repertory work: Orton spent 4 months in Ipswich as an assistant stage manager; Halliwell in Llandudno, Wales. Both returned to London and began to write together. They collaborated on a number of unpublished novels with no success at gaining publication. The rejection of their great hope, The Last Days of Sodom, in 1957 led them to solo works. Orton wrote his last novel, The Vision of Gombold Proval (posthumously published as Head to Toe), in 1959. He would later draw on these manuscripts for ideas; many show glimpses of his stage-play style. Confident of their "specialness," Orton and Halliwell refused to work for long periods. They subsisted on Halliwell's money (and unemployment benefits) and were forced to follow an ascetic life to restrict their outgoings to £5 a week. A lack of serious work led them to amuse themselves with pranks and hoaxes. Orton created the alter ego Edna Welthorpe, an elderly theatre snob, whom he would later revive to stir controversy over his plays. From January 1959, they began surreptitiously to remove books from several local public libraries and modify the cover art or the blurbs before returning them to the shelves. A volume of poems by John Betjeman, for example, was returned to the library with a new dustjacket featuring a photograph of a nearly naked, heavily tattooed, middle-aged man. The couple decorated their flat with many of the prints. They were eventually discovered and prosecuted in May 1962. They were found guilty on five counts of theft and malicious damage, admitted damaging more than 70 books, and were sentenced to prison for 6 months (released September 1962) and fined £262. The incident was reported in the Daily Mirror as "Gorilla in the Roses." Orton and Halliwell felt that that sentence was unduly harsh "because we were queers". However, prison would be a crucial formative experience for Orton; the isolation from Halliwell would allow him to break free of him creatively; and he would clearly see what he considered the corruption, priggishness, and double standards of a purportedly liberal country. As Orton put it: "It affected my attitude towards society. Before I had been vaguely conscious of something rotten somewhere, prison crystallised this. The old whore society really lifted up her skirts and the stench was pretty foul.... Being in the nick brought detachment to my writing. I wasn't involved any more. And suddenly it worked." The book covers that Orton and Halliwell vandalised have since become a valued part of the Islington Local History Centre collection. Some are exhibited in the Islington Museum. Orton began to write plays in the early 1960s. Eventually, in 1963, the BBC paid £65 for the radio play The Ruffian on the Stair, broadcast on August 31, 1964. It was substantially rewritten for the stage in 1966. Orton revelled in his achievement and poured out new works. He had completed Entertaining Mr Sloane by the time Ruffian was broadcast. He sent a copy to theatre agent Peggy Ramsay in December 1963. It premiered at the New Arts Theatre in May 1964. Reviews ranged from praise to outrage. Entertaining Mr Sloane lost money in its 3-week run, but critical praise from playwright Terence Rattigan, who invested £3,000 in it, ensured its survival. Sloane tied for first in the Variety Critics' Poll for "Best New Play" and Orton came second for "Most Promising Playwright." Within a year, Sloane was being performed in New York, Spain, Israel, and Australia, as well as being made into a film (after Orton's death) and a television play. Orton's next performed work was Loot. The play is a wild parody of detective fiction, adding the blackest farce and jabs at established ideas on death, the police, religion, and justice. With the success of Sloane, Loot was hurried into pre-production despite its obvious flaws. Rehearsals began in January 1965, with plans for a six-week tour culminating in a West End debut. The play opened in Cambridge in February to scathing reviews. In January 1966, Loot was revived, with Oscar Lewenstein taking up an option. The play garnered more favourable reviews. Orton was on an absolute high after the reception of Loot. Over the next 10 months, he revised The Ruffian on the Stair and The Erpingham Camp for the stage as a double called Crimes of Passion, wrote Funeral Games, the screenplay Up Against It for the Beatles, and his final full-length play, What the Butler Saw. In March 1967, Orton and Halliwell had intended an extended holiday in Libya, but they returned home after one day because the only hotel accommodation they could find was a boat that had been converted into a hotel/nightclub. Orton was working hard, energized and happy; Halliwell was increasingly depressed, argumentative, and plagued with mystery ailments. On August 9, 1967, Kenneth Halliwell bludgeoned 34-year-old Orton to death at their home in Islington, London, with nine hammer blows to the head, and then killed himself with an overdose of Nembutal. In 1970, The Sunday Times reported that 4 days before the murder, Orton had told a friend that he wanted to end his relationship with Halliwell, but did not know how to go about it. One of those writers of whom the words "If only....." are so appropriate.